I sometimes have a limited amount of bees for sale each year. 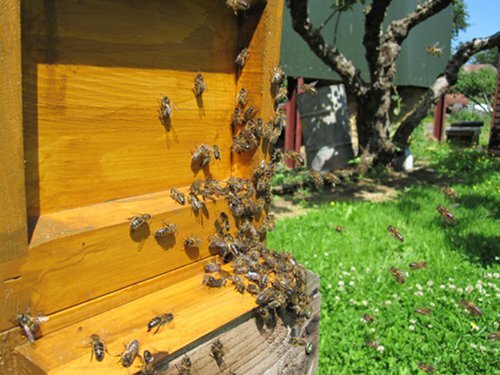 Queen rearing cannot start in Ireland till the end of the first week in May, when drones start to appear in the hives, so consequently queens will not be mated till late may/early June. Beware of nucleus colonies offered for sale, earlier in spring with imported bees. These bees may be quiet in their pure form, but when their daughters mate with our native bees they can become extremely aggressive. A nucleus colony (or 'Nuc') is just a small temporary hive, usually containing 5/6 frames. It will contain a laying queen that is clipped and marked. With proper beekeeping skills, all nucs will be strong enough to develop into a full colony before the winter. My bees are important to me, so I will only sell bees to people who are a member of their local association and have completed a beekeeping course. The queen will be clipped and marked, so it takes some of the pressure off beginners in their first year. There is a refundable deposit on the box itself. You can supply you own Nuc box either, but I will need it several weeks in advance of you getting your bees. 5 Frame nucs are available from June onwards. You will be picking up you bees in the cool of the evening when the bees have stopped flying, where they will be prepared for travel and suitably ventilated.